HuffingtonPost.com has a great story about how a 7-year old girl who uses a 3D-printed robotic arm, threw out the first pitch in Game 4 of the World Series in Houston. Read the full story on the Huffington Post website here. 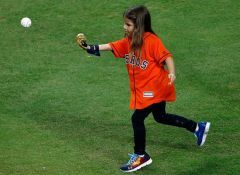 Seven-year-old Hailey Dawson, who has Poland syndrome (a rare disorder that can cause underdevelopment and deformation in hands) achieved a major accomplishment on Saturday by throwing out the first pitch.